Kristen Theriault has emerged as one of Canada’s most vibrant and innovative harpists. A versatile performer, Kristen’s artistry is evident whether exploring new music, playing with pre-eminent symphony orchestras or engaging new audiences at downtown clubs and festivals. Originally from Portland, Oregon, Kristen completed her Bachelors of Music in harp performance with celebrated recording artist Dr. Carrol McLaughlin at the University of Arizona, and then went on to receive her Masters degree from the University of Toronto, where she studied with world-renowned harpist Judy Loman. Kristen has played at the Shaw Festival, at the 2011 Juno Awards, at MuchMusic and has been featured on numerous CBC television and radio broadcasts. She has toured throughout Europe under the Hazelwood Records label and performed with Zeena Parkins at the CalArts Theatre in L.A. and at the Dance Theatre Workshop in N.Y.C. Kristen’s passion for contemporary music has led her to work with such composers as Charles Wuorninen, Bernard Rands, Michael Colgrass and David Felder. To feed her creative inspiration and further develop the sonic language of the harp, Kristen often presents free improv as a soloist and in collaboration at Toronto’s Arraymusic. She records and tours internationally and has been featured on classical, contemporary, jazz and rock albums. Along with maintaining a private studio for harp instruction, she also holds the post of Adjunct Instructor of Harp with the State University of New York at Buffalo. 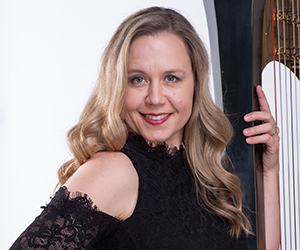 She regularly lends her talents to classical chamber ensembles and symphony orchestras, and is currently principal harpist for the Slee Sinfonietta. She has performed with the Toronto Symphony, the National Ballet Orchestra, The Burlington New Millennium Orchestra and the Niagara Symphony.